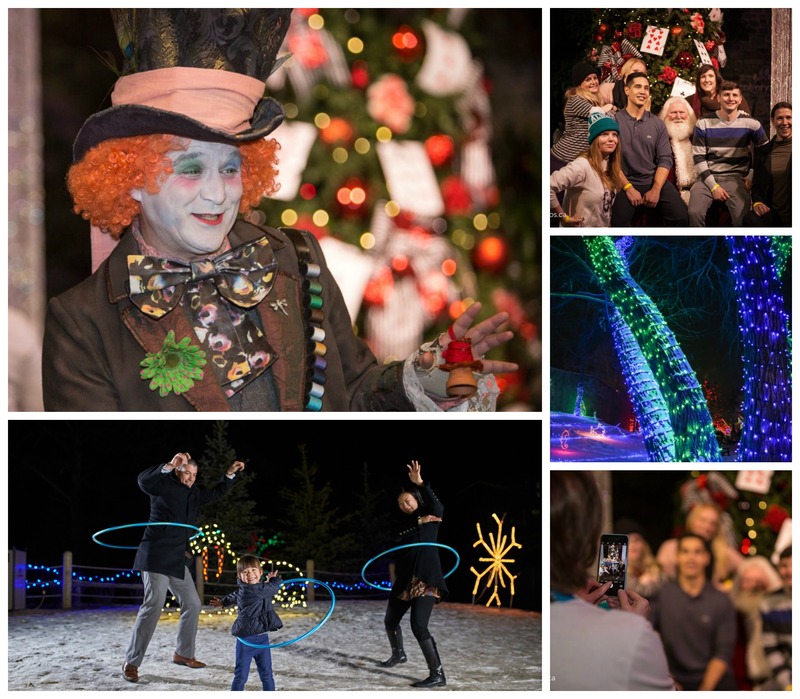 Get your glow on at ZOOLIGHTS presented by JSS Barristers– Calgary’s brightest holiday tradition! We’re back for our 20th year from November 24, 2017- January 6, 2018, and there’s no shortage of activities to keep visitors busy. Make sure to visit all four of our activity areas to ensure you don’t miss a thing. Think sleeping through the winter would be nice and easy? You might not have considered how much work it is preparing for such a long nap. Join us for an interactive learning experience that will help you learn more about the Vancouver Island Marmot’s hibernation. 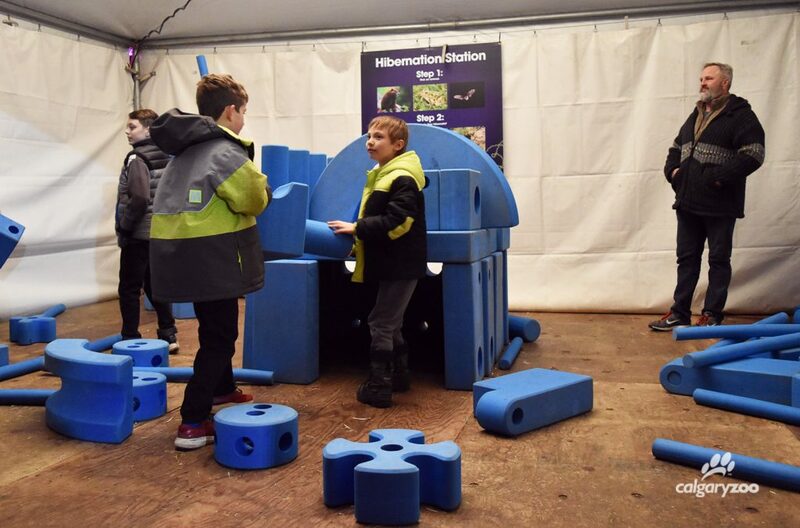 Build your own hibernation station at ZOOLIGHTS! Get ready to roll up your sleeves and make your own snuggling place. With a little guidance from our friendly volunteers, you and your kids can build a variety of different animal hibernation habitats with building blocks. It’s cold and getting cozy in your very own customized den will be awesome. Help the Whooping Crane get to its winter home by weaving your way through a maze of hay. Our straw-bale maze will have you giggling with delight as you find your way from one end to the other. Come play with our new giant Lite-Brite! You’ll get to create migration routes that help animals get from point A to point B. Come play with our new giant Lite-Brite! You’ll get to create migration routes that help animals get from point A to point B. You’re welcome to simply play with this larger-than-life retro toy, but we’ll encourage a bit of learning while you’re at it. See how long a migration journey you can achieve using our interactive game of tiered platforms and buckets. Understanding the effort migration takes is sure to make your commute feel shorter. Getting active is a great way to adapt to the cold weather- the skating rink is presented by the Calgary Hitmen. Getting active is a great way to adapt to the cold weather. The skating rink is presented by the Calgary Hitmen. Free skate rentals are available for all ages, from KidSport Calgary—with a DJ on Friday and Saturday nights. Looking for a treat after skating? 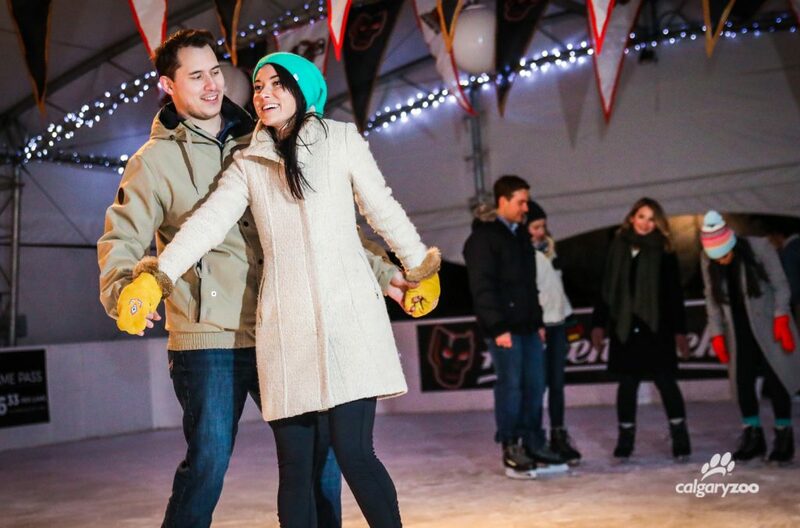 Stop by the Sugar Shack located by the rink, open 6 p.m. – 9 p.m. The Calgary Hitmen Farley the Fox will be visiting at the skating rink during ZOOLIGHTS. Come say hello! December 7 7 p.m. – 8 p.m.
December 15 7 p.m. – 8 p.m.
December 22 7 p.m. – 8 p.m.
December 29 7 p.m. – 8 p.m.
January 6 7 p.m. – 8 p.m. Looking for a great gift or just looking for a night out with your family? Take advantage of the ZOOLIGHTS Hitmen family pack! This package includes 2 adult and 2 child Hitmen tickets and 2 adult and 2 child ZOOLIGHTS tickets! Click here to purchase your tickets. Available for a limited time and may only be purchased through Calgary Hitmen. In order to adapt to the winter weather, certain animals have to grow extra fur or feathers. 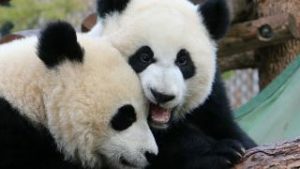 Learn what it feels like to be these animals with a dress-up activity, then take your photo and share it on social media. Animals are not the only ones who have to adapt to winter—you can help Build a Buddy Snowman adapt by dressing him up too. What does gaining weight for winter feel like? Try walking around wearing body weights to mimic your survival load. 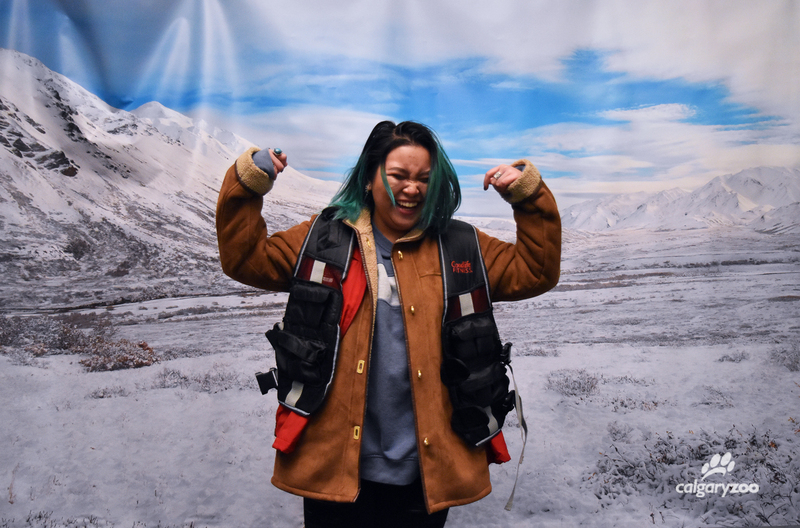 Plus, once suited up you’ll get to tackle an obstacle course designed to help you understand what our furry friends go through during winter. What could be more fun than a giant puzzle? Maybe four giant puzzles that show us what animal adaptation looks like? One side of each puzzle shows an animal’s winter colouring while the other side shows its summer colours. Gather your group together and see who can puzzle the fastest! Let us be your selfie stick. 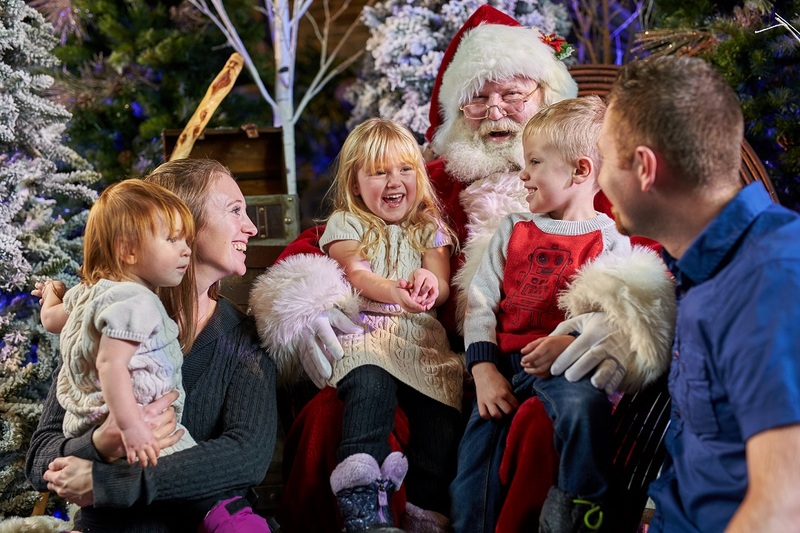 Get your picture with Santa in the mystical world of Wonderland with everyone in the shot. Santa will be with us through December 23. Last entry to the queue is at 8:30 p.m. nightly. Have a seat and listen to a story. Get carried away to a different place—it’s a relaxing and warm way to enjoy the evening. Thursday through Saturday guests can come into the ENMAX Conservatory DOW classroom to create a themed craft. Wander on down and see what we have in store for you—we’ll be switching it up. You’re going down the rabbit hole with Alice and friends so you never know who you might find. We’re sure the Mad Hatter will be around every Thursday night, and he’s sure to be found in good company! Come find out for yourself. Catch a ballet performance by the classic winter Sugar Plum Fairies in the Garden of Life on December 20/22, 2017. We have brought the escape room to you! Located by the playground in Destination Africa every Saturday and Sunday. 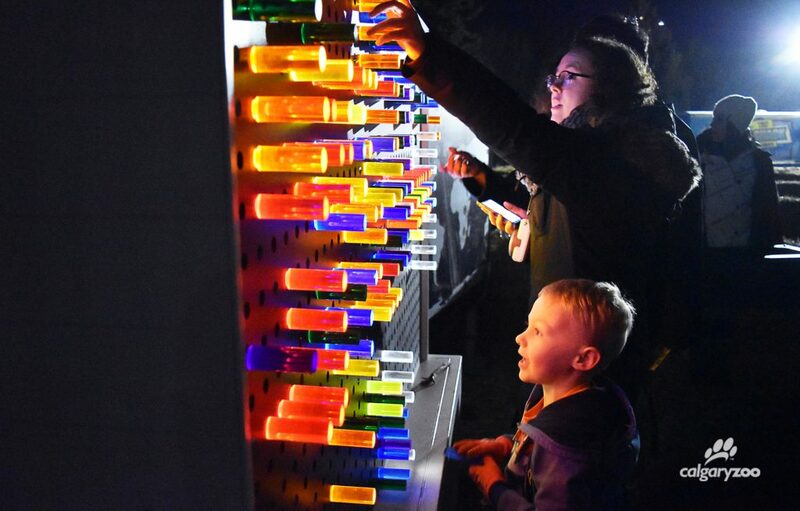 Find these glowing artists roaming the grounds every Friday, and a special visit on December 24. There will be a choir on grounds on December 22!